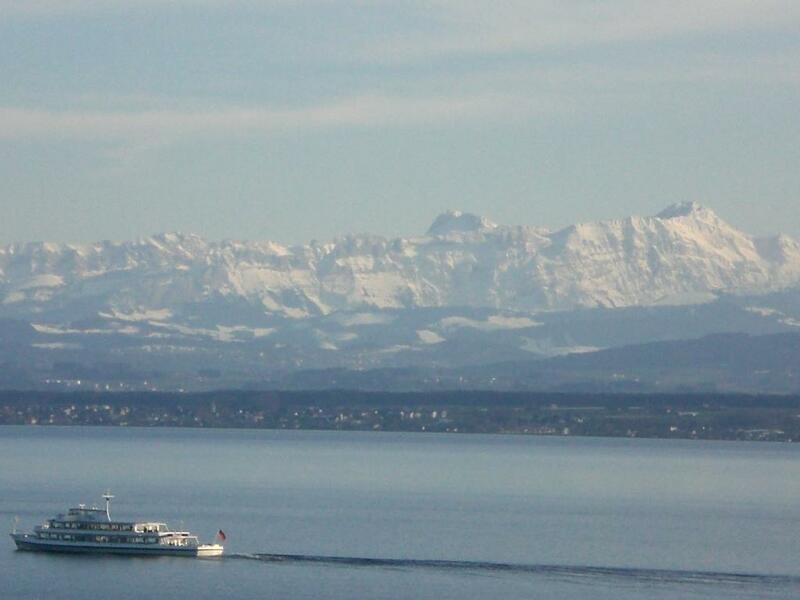 The holiday flat is located in a very quiet location, with unobstructed views of Lake Constance and theAppenzell Mountainsof Switzerland, on the highest point above Meersburgin the village of Daisendorf. The size of the holiday flat is approximately 100 square meters. There are 3 bedrooms, a large living and dining room, kitchen, bathroom, separate toilet, a small and a large balcony overlooking the lake. There is room for up to 6 people here. We have rented the holiday flat since 2007 to holiday guests and we renovate the flat regularly. Please understand that we can not allow dogs and other pets. The floors are brightly tiled, 2 bedrooms have maple laminate floor. The holiday flat is equipped with underfloor heating. Therefore, it is also suitable in the winter months for a relaxing holiday. It is a non-smoking holiday flat. We have furnished the holiday flat for you to feel comfortable. In the kitchen you will find among other things spices, coffee, water and supplies that you do not have to bring with you. The kitchen is equipped with a stove, oven, microwave, coffee machine, espresso machine, kettle, toaster, dishwasher, and a fridge with freezer. Dishes and pots or pans are abundant. In the immediate vicinity of the house there are enough parking spaces available. Literature about Lake Constance with map material and city maps, as well as games and some books are available. The living room has a TV with DVD Player and a stereo with CD / radio. Wi-Fi for free use. We provide you with towels, kitchen towels and bed linen. After your departure, the holiday flat will be cleaned. This is included in the weekly rate. In the village of Daisendorf there are good shopping opportunities, e.g. a country bakery, where you can get fresh bread in the morning, and a supermarket. In Meersburg, which is only 1 km away, there is a variety of shops. The surrounding area offers a wide range of excursions, leisure activities and good restaurants. In addition to the open-air swimming pool with access to the lake in Meersburg, there is a spa with sauna and hammam.